A great hand carved seatting Neptune statue carved and designed from our sculptor, complete with an iron trident. The Neptune is seat on rocks with a carved dolphin drilled for water on side. Nice to place near a swimming pool or a lake, for a nice water effect. Neptune (Latin: Neptūnus) was the god of water and the sea in Roman mythology and religion. He is analogous with, but not identical to, the Greek god Poseidon. 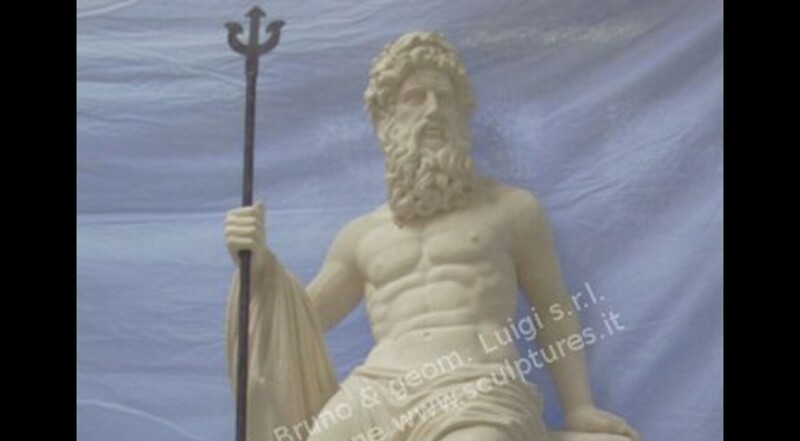 In the Greek-influenced tradition, Neptune was the brother of Jupiter and Pluto, each of them presiding over one of the three realms of the universe, Heaven, Earth and the Netherworld. Depictions of Neptune in Roman mosaics, especially those of North Africa, are influenced by Hellenistic conventions. Dimensions: Height 59" with iron height 79"